émoi is all about expression. émoi is a service and data representation interface that encourages creative self expression because it allows its user to use chocolate as a medium through which they can express their sentiments towards others. The display of the user’s emotions through chocolate is produced via a representation language that uses gustation and oral somatosensory experience as it’s symbols. This representation language utilises intuitive meaning that is produced through the qualities of taste, texture, shape and colour and their relationship with human attitudes in order to communicate the user’s desired sentiments. The representation language is based on already-existing research into intuitive understanding and gustatory, oral somatosensory and cross-modal experiences in humans. The choice of chocolate as the medium for this representation system is very fitting, since chocolate is somehow intrinsically tied both to personal emotion and to interpersonal exchanges within our societies today. On the level of personal experience, chocolate lovers have long testified to its ability to palpably stir emotions within them, using it to indulge both when in low-spirits and as a well-earned reward. While when it comes to interpersonal expression, chocolate has been a staple in longstanding traditions of gifting and sharing. Whether for grand celebrations, traditional festivities, or modest gestures, chocolate has often been the go-to gift for a variety of occasions. Finally, émoi is particularly special because it gives the user the opportunity to break away from traditional contexts of sharing chocolate, allowing them to create their own personal expression based on their own unique situation. 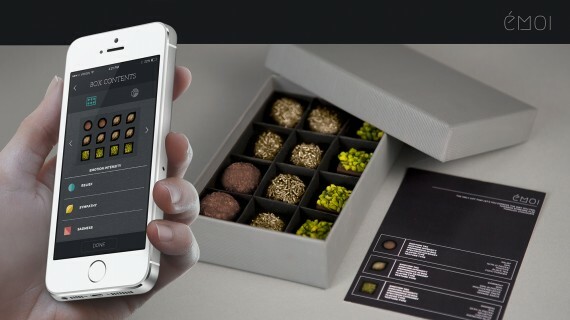 Using émoi the user can personalise their chocolates from a diverse set of both positive and negative emotions that they can be as candid or as secretive with as they like. So, whether it’s love or hate, sadness or pride, émoi let’s its user express their deepest and truest feelings – whatever they may be.